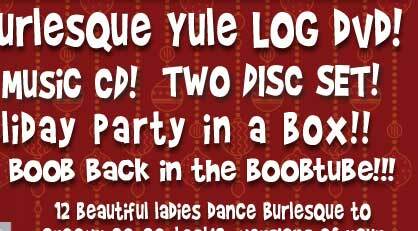 Angie, Anita, Pontani, Cookie, Honeychild, Creamy, MSTickle, Peekaboo, Cabral, Bunny, Brooklyn, Harvest, Julie, Atlas, Muz, Little, Brooklyn, Christmas, Hanukkah, log Yule A Go-Go - The Burlesque Yule Log DVD! - Girls Yule, burlesque, pasties, CD, fireplace, fisherman, breasts, DVD, holiday, go-go, Angie, Pontani, Julie, Atlas, Muz, Little, Brooklyn, Christmas, Hanukkah, log 'Tis the season...Thirteen beautiful women dancing burlesque to Go-Go-tastic versions of Christmas and Hanukkah songs, all in front of the classic Holiday Yule Log. Yule A Go-Go is, without a doubt, an original holiday release. The two disc set: DVD and music only CD are packaged in a double embossed designer box featuring red, silver and green foil – it's a holiday gift, wrapped to go. Or at only $19.95, it's the perfect stocking stuffer home.